We defer from the norm. Our Artists do not all have education backgrounds or experience teaching but they are all artists. 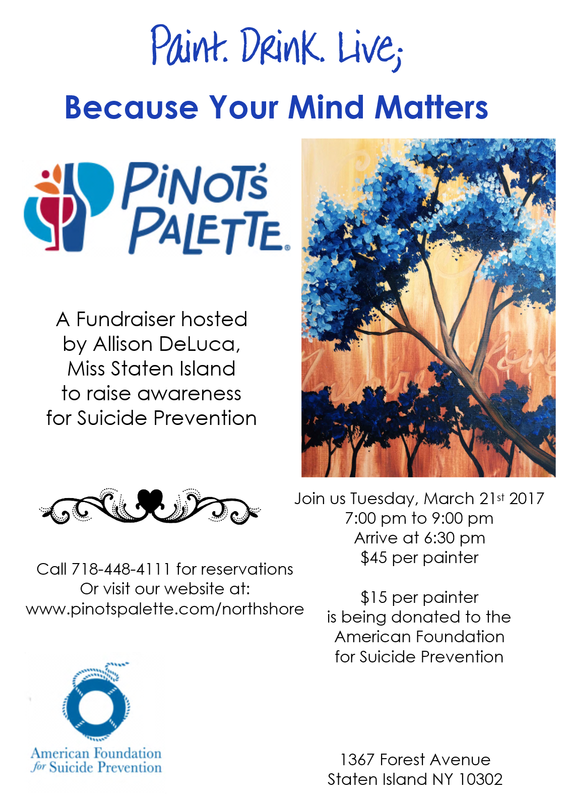 They come from all over Staten Island to share with you, their talent and their passion, providing you with a memorable class where you develop your own painting skills. You get to interact with them on a personable level and for some, it provides the foundation to build a relationship – whether as an aspiring artist, as a mother who is looking for a hobby, as a child who is looking for an outlet. The Artists we have here provide the studio with a sense of home, here on Staten Island. You don’t need to be an artist to attend. Never painted before? Stick figures are your forte? No problem. This is an awesome environment for everyone. Whether you’re just looking for something new to do, something to share with your child, or somewhere to learn new painting techniques because deep down, you’re an artist at heart. Taste a new wine before enjoying a glass while you paint. What better way to spend your day than relaxing with a beer, hard cider, or glass of wine and a paintbrush in hand. We also offer soda, juice, bottled water, and coffee. These paintings are perfect to share with that special someone in your life – whether romantic, family, or your best friend. While you’re working on your own canvas, your “date” is working on theirs, and at the end of the night, you push the two together to make the painting whole. Painting is the new yoga. We are always looking for ways to let loose, relax, and express ourselves. We want to escape the busyness of our lives and the chaos of our schedules. Our painting classes provides the opportunity to do so. Whether with a group or by yourself, painting is its own form of therapy and 9 out of 10 times, it will become your newest and most favorite hobby. Pinot’s Palette NS is a place of diversity; a place where all ages can come together and be a part of something beautiful. We host both adult parties and events, and children’s parties, boy/girl scout events, and school trips. We offer paintings that are easier for younger kids and ones that are perfect for all ages. Our paintings are for both women and men, as well. Who doesn’t like to give back? Who doesn’t want to do more? To offer a hand where we can? Pinot’s Palette NS hosts various fundraisers, donating money per painter towards cette specific charity. Upcoming we have two fundraisers for March for Babies – one is a glass class Wednesday February 15th 2017 at $40 per painter with $15 being donated to the March of Dimes. Friday March 31st 2017, painters will be painting “Colorful Swirl Sky” which is $40 per painter with $10 being donated to March for Babies. Pinot’s Palette also partnered up with the after-school theatre program – “The Standing Ovation Players,” at $35 per painter with $5 being donated per painter. Paint it Forward and book your next fundraiser with us now! Or reserve your seat for one of the many, where donations go to a life changing cause. Instead of looking for something to add to your bucket list that’s out of state, our North Shore studio gives Staten Islanders something new and local to take part in. It’s this fun afternoon or night to get together and enjoy ourselves, with so many people from our own hometown. It provides the opportunity for different neighborhoods to come together and make new friendships and create new memories. It’s not something you have to go into the city for or travel to another state to do, it’s right here in your own backyard. As Valentine’s Day approaches, whether you’re single or taken, Pinot’s Palette North Shore has your back. All you need is a full glass of wine, music with an encouragement to sing, dance, and let loose, all your ladies, a paintbrush, and Galentine’s Day. This combination makes for a memorable experience. “Galentine’s Day” is a fictional holiday that occurs the day before Valentine’s Day and this one is for the ladies – best friends, sisters, mothers, aunts – all the special women in your life. We, at Pinot’s Palette love the concept so much, it doesn’t last for a day but for the entire month of February. Some people love the romantic rose petals, chocolate, and thoughtful dates, some people hate the entire concept of it, and some people believe in 365 days of love, but the consensus is that everyone loves Galentine’s Day. G-Day provides plenty of opportunities to make time. Make time for those best friends whose schedules never seem to fit yours. Make that time to take your mom out on a mother/daughter date. Make time to celebrate you. We give you a place to come and relax and bring out your inner artist for a special girl’s night out or a day just dedicated to you. At Pinot’s Palette, we believe that sometimes your soulmate isn’t a lover. Sometimes you find your soulmate in a best friend, your mom, your sister, your niece. They’re the ones who are there for you during your irrational theories, your nervous breakdowns, your adventurous ideas, and every moment in between. They’re your partners in crime and those people are worth celebrating. You’re worth celebrating. So come in and celebrate these small treasures this February.